After leaving Sevierville and upon entering Pigeon Forge on US 441, watch for Stoplight #3 where you will turn right on Jct. 321 South (also called Wears Valley Road). Go 2.7 miles. Turn right onto Waldens Creek Rd. 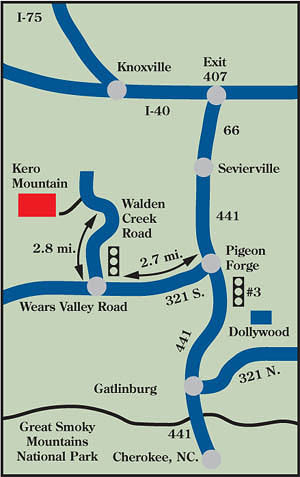 and continue on that winding road for another 2.7 miles where you will turn left on Little Valley Road at the Kero Mountain sign and follow signs up to the office. We are 5.25 miles from Pigeon Forge, Dollywood and the factory outlet shopping malls, 15-20 minutes drive from Gatlinburg and the entrance to the Great Smoky Mountains National Park, and a 20-30 minute drive from Townsend and Cades Cove.